When you are trying to lose weight, it is important to know which foods can help the most. Many fruits and vegetables are good for weight loss, because they are low in calories and you can use them at almost any kind of meal or as a snack. Fruits and vegetables are nutritious choices, but talk to a nutritionist to make sure that your diet program includes a balanced meal plan. Leafy greens such as lettuce, spinach or endive are good for weight loss. They are low in calories and you can use them as the foundation for a side or entrée salad. Almost any raw vegetable makes a good addition to the greens and possibilities include radishes, cucumbers, tomatoes and sprouts. 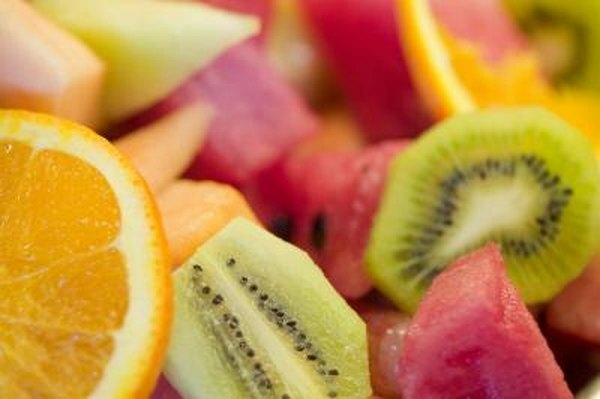 Add flavor while keeping the calories low by adding some fresh or canned fruit such as sliced strawberries or mandarin orange sections. Full-fat salad dressings are high in calories, so use a light dressing, lemon juice or a small amount of regular dressing. Snacking on raw, whole fruits and vegetables can help you stick to your diet by keeping your calories low while reducing your hunger between meals. Try apples, oranges or nectarines, berries, honeydew melon, watermelon, cantaloupe, baby carrots, red or green bell pepper strips, broccoli or cauliflower florets and cherry tomatoes. You can dip your vegetables in a low-calorie dip. These choices are high in dietary fiber, which keeps you feeling full for longer and increases your chance of weight loss success, according to a review in the March 2005 issue of "Nutrition." . Fruits and vegetables that you add to your regular recipes can be good for weight loss. Spinach, mushrooms, eggplant, broccoli, carrots, onions, zucchini and cauliflower can be good additions to soup, salads, omelets, casseroles or sauces. You can add blueberries, strawberries, raspberries or apples to oatmeal, cold cereal or yogurt. Adding fruit or vegetables to your recipes makes your food less calorie-dense, which can help you lose weight. Fruits and vegetables that you eat along with your meal can be good for weight loss because they make your meal bigger and more filling without adding many extra calories. Good side dishes include side salads, broccoli, green beans, brussel sprouts, cabbage and fresh fruit salad. Starchy vegetables such as yams or winter squash are higher in calories, but they are still better for weight loss than high-fat, high-calorie side dishes such as buttery mashed potatoes or bread stuffing.